Somehow, I can't leave well enough alone... so I try to tweak recipes. I find myself lowering the butter, sugar and egg amounts, if at all possible. And if it's possible, then I certainly will:). You know, I think most desserts really don't need all that butter and sugar. It's unnecessary really. And I truly believe that... a true baker might not agree with me though:). So when I embarked on making the traditional Romanian Amandine, well, I knew I'd want the recipe to be delicious... but without the "extra" butter and sugar. Of course, it wouldn't be delicious, without some butter and sugar:)... because butter + sugar = flavor. However, I thought I could get away with lowering some of the eggs normally found in sponge cakes by adding some leavening. It took a bit of research, adjusting and finally starting the Amandine recipe. 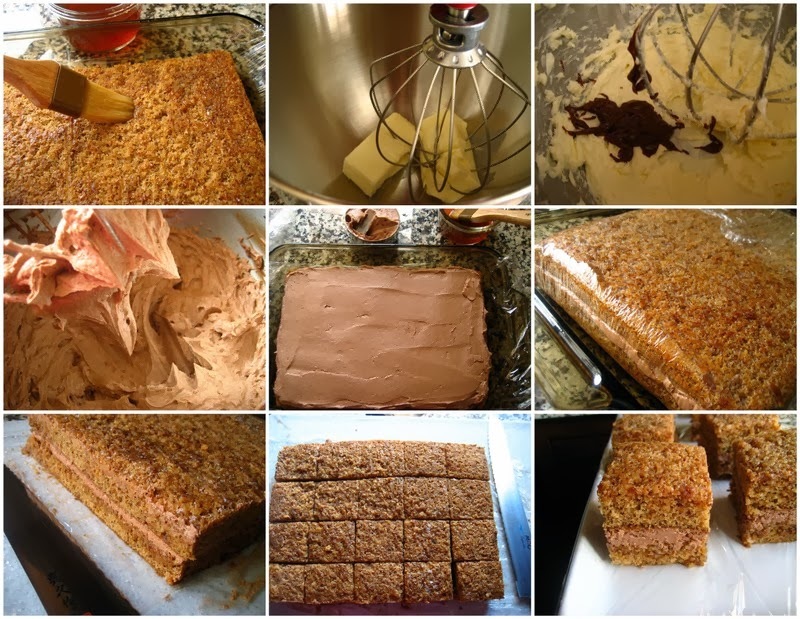 While researching all sorts of European dessert recipes, I found that cakes, such as the Opera, Dobos, and other layer cakes relied heavily on sponge cakes. 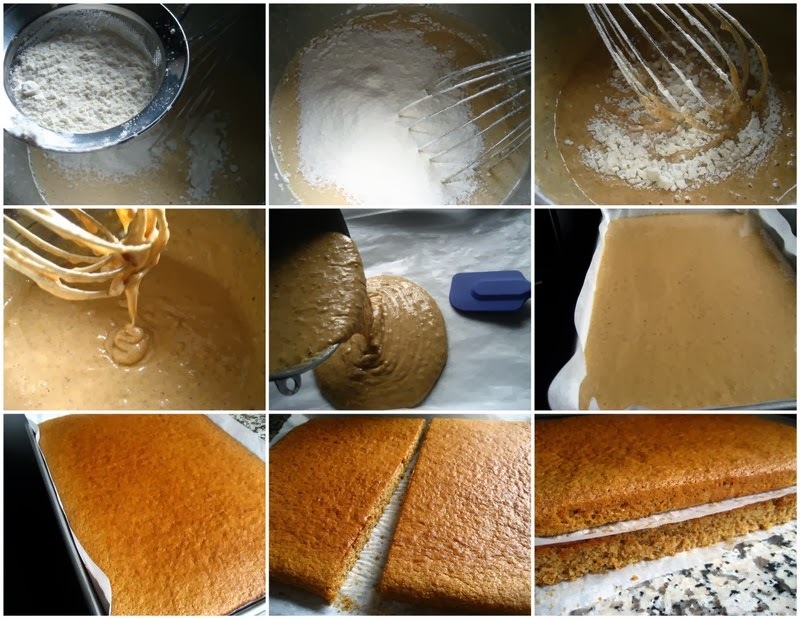 I loved how techniques varied when making a typical "sponge" cake... from the joconde(with nuts), to the genoise(beaten whole eggs), to the regular sponge cake(with or without leavening), they all had their own role. So I researched some more and found an amandina recipe that used a "joconde"-like sponge cake, but with added leavening. While most amandine recipes online are based on a chocolate sponge cake, I felt the amandina cake layers should be a bit different, more special than just a chocolate cake .... and so I went with a nut based sponge cake with leavening. The nuts would add a ton of flavor as well as texture. The buttercream was my worst fear... all that butter:)! However, I knew I couldn't get away without it, so I settled on a buttercream that's not so popular... the German buttercream. I loved it because it relied mostly on a custard and not so much butter as other buttercreams. I suppose I could have eliminated the eggs entirely from the custard(making a cooked flour frosting)... it would make the cream even lighter. But I chose to add the eggs, just because this recipe won't be made that often:)... and I felt I had cut enough of the butter and sugar in the overall recipe. Now the Romanian amandine are quite moist, the sponge cake is usually moistened with a rum flavored syrup. If you didn't know, Romanians love their rum. 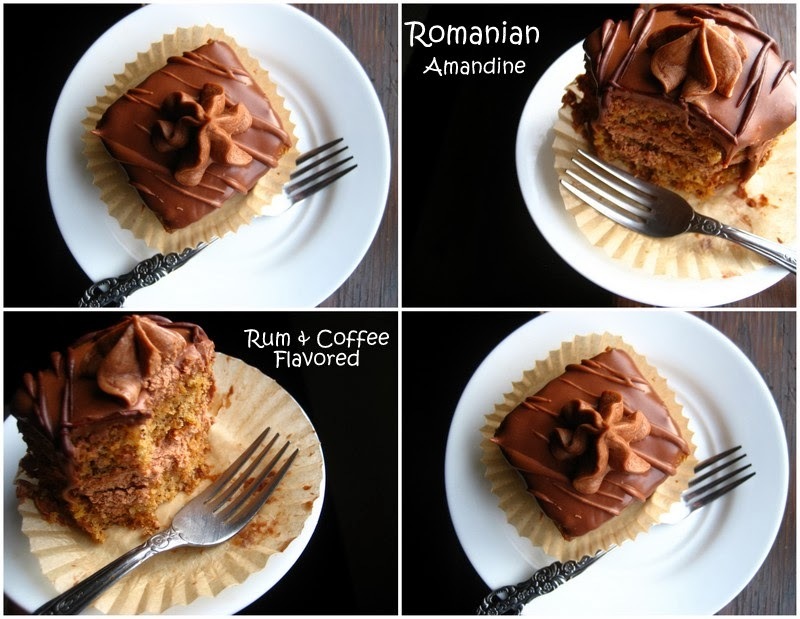 You'll find the rum flavor in a ton of Romanian desserts, I suppose as you would find vanilla in American desserts. It's that popular. And even though the amandine, as the name implies, should have a predominant almond flavor, it's been changed to other flavors over time... coffee can be added, rum as I mentioned, or even just vanilla. 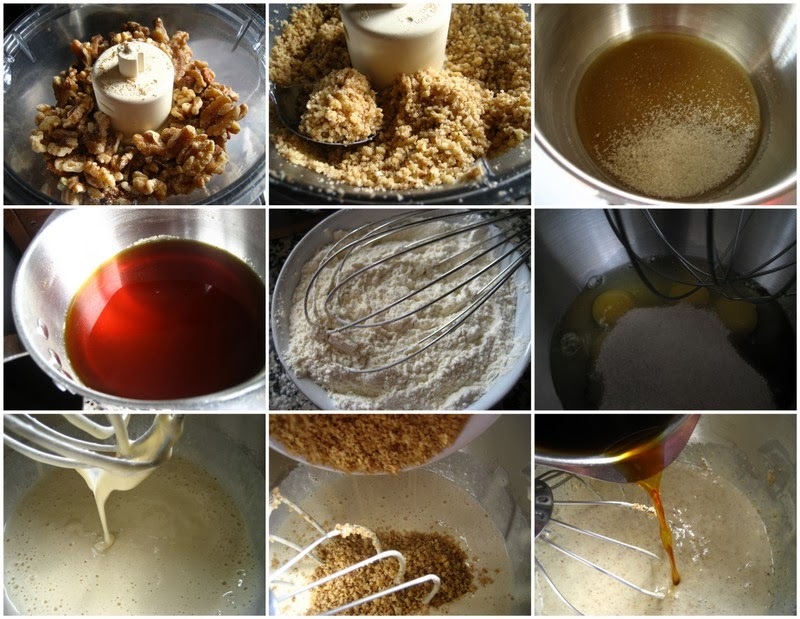 While I posted the amandine recipe as I made it, you can certainly adapt it and make it your own. Make a simple sponge cake, moisten it with a syrup, layer it with your buttercream of choice, even a whipped ganache would work, and glaze it as simply as you like. Add flavors that you prefer... you don't need to use rum, if you don't care for it. But this is my version... a combination of flavors we like, not overly sweet, though sweet enough... and not overly buttery, so it falls heavy. And although I've used a few teaspoons of rum, I don't think it's too overpowering... at least not for us:). Note: This took 2 days... By the end of the second day, I had had it in the kitchen.... I guess I'm not much of a baker:). But on the 3rd day, after my very first bite, I fell in love with the recipe... it was so totally worth it. Not too sweet, nor overly buttery. Just right. My piped buttercream looks a bit soft... I ended up refrigerating the amount I reserved for piping, so when I needed to pipe it, well, it had hardened. I warmed it up again... maybe a bit too much:). Tip: Serve the amandine, the day after making them, as the flavors are at their best... and serve close to room temperature. You will need: Cake and soaking syrup adapted from Prajituria... German Buttercream idea inspired in part by BraveTart and chocolate custard portion of buttercream by Food and Wine. Glaze was mine... typical thinned out ganache:). I'd recommend using the scale amounts for better accuracy. 1. Using a food processor, grind nuts till fine. Set aside. 2. In a sauce pan, add sugar, heat on medium heat and melt sugar till amber in color and all sugar is dissolved... swirl the pan to evenly melt the sugar, being extra careful to not burn sugar. Take pan away from heat and add water ... it can splatter, so be careful. Use a whisk to combine... you might get some hard caramel, but it will dissolve as it sits. Set aside to cool. 4. Using a whisk attachment, beat eggs and sugar on high till light and fluffy... about 2 minutes. 5. Add vanilla extract, oil and nuts. Fold gently to combine. 6. Add cooled caramel water and combine until just mixed. Don't overmix. 7. Sift flour mix 1/3 at a time over egg mixture and using a whisk(or a spatula) gently fold in the flour, being careful not to deflate the mixture too much. 8. Pour batter in prepared pan, lever batter with a spatula, and give the pan a gentle tap on the counter to release any large bubbles. 9. Place pan on center rack in preheated oven and bake 13- 15 minutes or until golden and toothpick comes out clean. 10. Remove sponge cake from pan and allow to cool, cut cake vertically, in 2 equal parts. Note:You can at this point freeze cake for assembling Amandine another day if you like.... which is what I ended up doing. Just wrap well. 1. In a sauce pan, add sugar, heat on medium heat and melt sugar till amber in color and all sugar is dissolved... swirl the pan to evenly melt the sugar, being extra careful to not burn sugar. Take pan away from heat and add water ... it can splatter, so be careful. 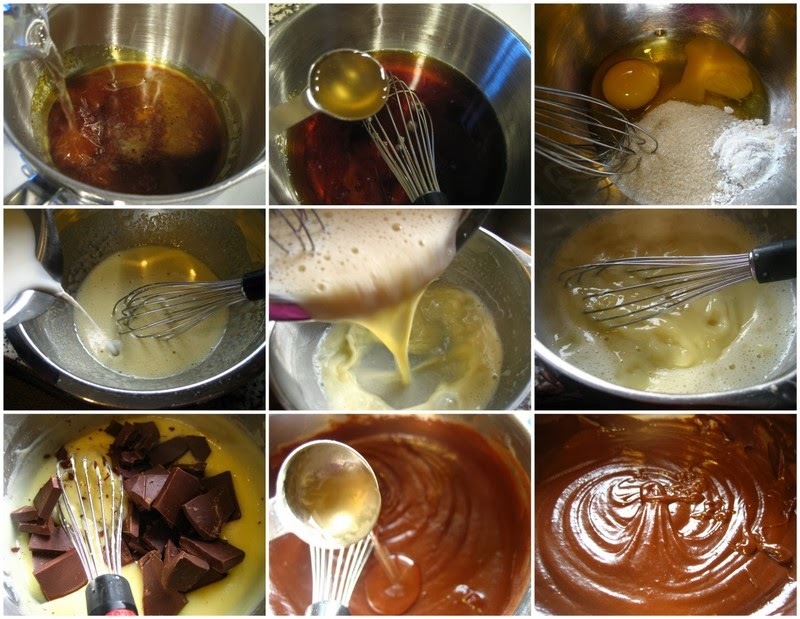 Use a whisk to combine... you might get some hard caramel, but it will dissolve as it sits. Stir in rum extract. Set aside to cool. 1. In a bowl, whisk, egg , yolk, sugar and cornstarch. Set aside. 2. Heat milk in a sauce pan until small bubbles around the edge of the pan are evident... scalding the milk. 3. Remove scaled milk from heat and slowly add to egg mixture, whisking to combine to temper the eggs. 4. Place tempered egg/milk mixture back in sauce pan. 5. Heat egg custard mix on medium heat, whisking all the time, until it thickens and starts to bubble slowly... and then heat for another 30 seconds or so after that to cook out the cornstarch. 6. Remove from heat and stir in chopped chocolate, whisk to combine and then add the rum and instant coffee. 7. Allow custard to cool completely, covering with a plastic wrap on the surface so it won't form a skin. Place in refrigerator to cool thoroughly if needed. Note: You will need to bring the refrigerated custard back to room temperature when mixing it with the butter, as you want the custard and butter to be at about the same temperature, otherwise the buttercream can separate. 8. Line the inside of a 13x9 pan with plastic wrap leaving some overhang enough to eventually cover the cake layer. Place one cake layer in pan and using a pastry brush soak cake layer using only half of the caramel/ rum syrup. Set aside while you finish buttercream. 9. Using a whisk attachment, beat butter until light and fluffy. 10. Add custard in small amounts to the butter while mixing to fully incorporate the custard... continute adding custard and mixing till all of the custard is used up and buttercream is light and fluffy. If at any time the buttercream looks a bit curdled, or separated, this may be because the butter and custard were not at the same temperature... one was probably too cold. As a fix, you may want to remove the mixer bowl and place the bottom of the bowl in some hot water( bain marie style) for a bit to warm the cream gently... and then whip it again... it should get rid of any separation. 11. Remove about 3/4 cup of the buttercream and set aside... that is, if you want to make the buttercream swirls on top of each amandina. 12. Using an offset spatula, spread the rest of the buttercream evenly over soaked cake layer. 13. Place second cake layer on top of the buttercream and repeat soaking cake layer with the second half of the caramel/rum syrup. 14. Bring the plastic wrap over the entire cake and refrigerate(or freeze) until cream is hardened. It is easier to slice cake neatly when mostly frozen. 15. Remove cake layers from fridge and trim edges. Cut in small squares... about 2x2 inch squares. 1. Heat whipping cream to a boil, remove from heat and add chocolate. Whisk until fully combined and smooth. 3. Spread about 1 1/2 TBS ganache over cake square using the back of the spoon to cover the whole surface and allowing some of the ganache to fall slowly over the edges. Repeat with all squares. 4. Drizzle lines of any reserved ganache over each square, if desired... or add a bit more melted dark chocolate to a bit of the ganache(or even use some whipped cream) to drizzle a darker chocolate lined variation. 5. Place the reserved buttercream in a piping bag with favorite tip and pipe small mounds in the center of each glazed amandine. 6. Refrigerate amandine so glaze hardens a bit. 7. Remove amandine from fridge and allow to get to room temperature before serving. NOTE: Amandine are best the following day as the flavors improve overall. Just bring to room temperature before serving. They also freeze amazingly well... freeze amandine on a sheet pan until hard(best if each is placed in a cupcake liner) then place in container of choice, covered. Great recipe! I've made it many, many times. Like you, I am reluctant to make any butter based fillings, and avoid them at all costs. In this case I make a chocolate ganache instead of buttercream. German buttercream mi se pare cam complicat. Sigur e bun, dar ganache-ul nu da gres. Blatul l-am facut putin diferit, asta suna mai bine si o sa-l incerc. Maine fac bagels, iti spun sum imi iasa. G'day and wow! Your cake looks amazing, true! Great photos and wish could come through the screen and try some now too! Laura, Thanks! Yes, I agree, chocolate ganache is definitely foolproof:)... I was thinking of making a whipped ganache frosting, but I wanted the amandina to be a bit special, more traditional I guess... so the German buttercream won:). 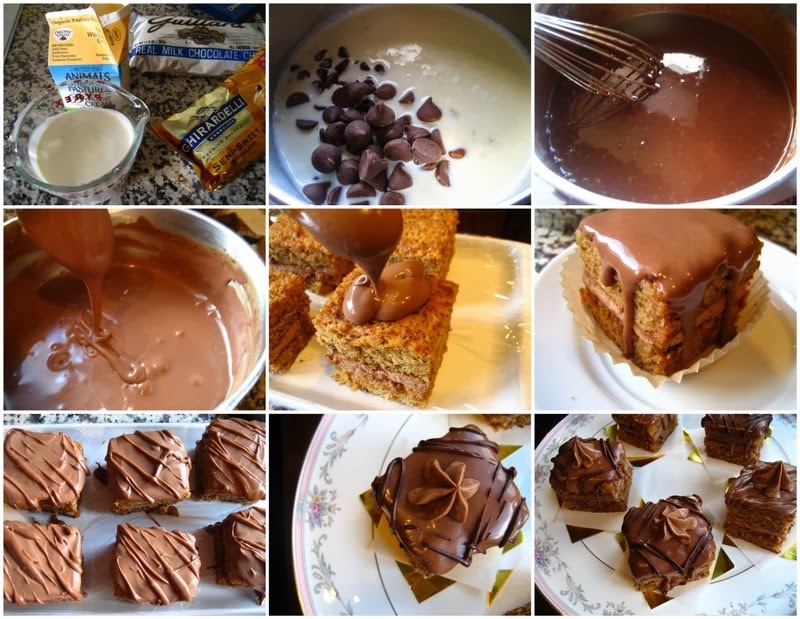 The nuts in the cake make it super special, gives it texture as well as flavor. The cakes definitely weren't heavy as other buttercream cakes tend to be... just my own observation:). Ma bucur ca ai incercat bagels... si iti multumesc mult pentru feedback! Iti doresc o zi faina! Joanne, Thanks a bunch:)! Wish I could give you a piece... I still have a few in the freezer:). They actually freeze VERY well! Dana, Thank you kindly:). Sper sa iti placa si tie... of course, poti sa si schimbi reteta dupa gust si experienta:). Ma-si bucura daca iti iasa si tie... stiu ca glazura am trebuit sa astept catva timp pana sa ingrosat sa fie "pourable" ca sa nu fie prea suptire. How much chocolate in the buttercream. Recipe says to add it, but does not state how much. You can use a bit less or a bit more chocolate if you like... an ounce or so, give and take.